Waves Diamond bundle is for everyone who needs a comprehensive set of audio processing tools. The Diamond Bundle includes Waves Platinum , Restoration , and Transform bundles for a total of 41 processors forming your studio's processing core. Waves Diamond Bundle is the most comprehensive set of audio processing tools, now including Q-Clone, Tune LT, L3 Multimaximizer, and IR-L Convolution Reverb. 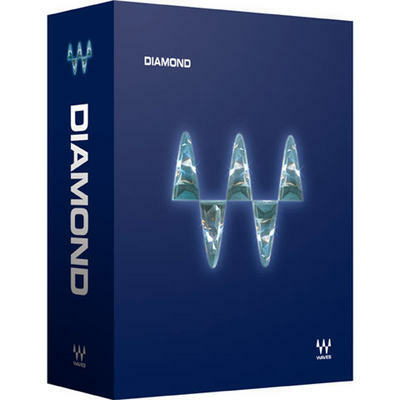 Diamond reflects unprecedented scope of Waves signal processing mastery, bringing to your studio the fruits of years of proven and award winning engineering excellence in audio. Select from a multifaceted array of tools for tracking, mixing, mastering, creative sound design, audio restoration; Puristic, analog-modeled, surgical tools, or sound bending, Diamond has all facets. * Cost Effective: Pay less than Platinum + Restoration + Transform ; Have all the tools you need exactly when you need them. * Years of Research & Design excellence: doesn't your audio deserve the best? * C4 Multiband Parametric Processor - 4-band up and down expansion, limiting, and compression, plus dynamic and standard EQ. Features 48-bit double-precision, dithered to 24-bit output for TDM. * L1 Ultramaximizer - Lookahead peak limiting with advanced requantization, providing maximum level and highest resolution for all audio applications, from CD mastering to multimedia. L1 can be used as a mono or stereo limiter, with or without IDR processing. * MaxxBass - Takes your bass to the maximum on more speaker sizes, from any source, by adding a series of harmonics to the signal. These harmonics stimulate a psychoacoustic bass-enhancing effect - a phenomenon that small speakers rely on to play audible bass. * Q10 Paragraphic Equalizer - Provides precision control of EQ from subtle adjustments to extreme complex filters. Ideal for any aspect of audio production. Q10 works in mono/stereo, and with one to 10 bands of equalization. * S1 Stereo Imager - True Blumlein shuffling, M/S and L/R processing, four unique stereo-image tools, unequaled anywhere.A unique set of tools for remastering stereo mixes by enhancing and altering the stereo effect. * C1 Parametric Compander - The ultimate dynamic equalizer, and father of the https://www.tradebit.comect any frequency range, then compress, expand, limit, or gate those frequencies. * Enigma - Ideal for creation of creative filtering. Combines a complex notch filter system, short delay feedback loops, and modulation. New V5 version includes tempo sync! * Super Tap - Six taps with up to six seconds of mono or true stereo delay. Each tap includes independent Q10-style filtering, rotation (stereo panning), gain, and precision time control. * MondoMod - A unique combo of linked AM, FM and Rotation Modulators yielding gentle wandering guitar solo panning or bizarre destructive effects, all in one plug-in. Version 5 also supports tempo sync. * Doppler - Real-time doppler effects. Waves Doppler gives you auto and manual triggering modes, plus full control of air damping, panning, pitch, path curve, gain, start/stop points, and reverb tail. * UltraPitch - An incredible formant-corrected pitch shifter with six voices (yes, *six*). All pitch shifting is done with optional formant correction to avoid the old chipmunk effect, or for excellent gender-bending. * MetaFlanger - Produces vintage tape-flanging, phaser-emulation, and special effects like no other flanger, ever. Create gentle choruses, sharp phasing effects and a variety of true dual-delay flanging sounds quickly. Version 5 also supports tempo sync. * TrueVerb Room Emulator - One of the best room emulations in existence, with exclusive distance control. Define the room, choose your seat! * DeEsser - Precision high-frequency dynamic processor, modeled after vintage gear for fast, easy de-essing/HF limiting. Perfect for editing solo vocal takes and instrumentals. * Audio Track - The original channel insert with 4-band, fully parametric EQ, compressor, and gate, all in one space-saving window. Unbelievably efficient on any system! * PAZ Psychoacoustic Analyzer - Realtime analyzer based on our hearing, shows 52 or 68 bands, with RMS, peak, weighting, variable integration time, and much more. * Renaissance Channel - A precision channel processor combining the best and finest EQ, compression, limiting, and gating. This processor takes the concept of the channel insert to the limit and beyond. * Renaissance EQ - The highly praised double-precision resolution vintage EQ, featuring distinctive emulation of classic analog EQ sound. * Renaissance Bass - A second generation of Waves' popular MaxxBass offering a simplified interface. Achieve that warm, fat, and massive low end with few adjustments and NO distortion. * Renaissance Reverberator - Classic sound and vintage-style controls for the demands of everyday production. Rich reverb tails plus early reflection system gives the density and texture you deserve. * Renaissance Compressor - Exceptional compressor with vintage Opto modeling, plus the exclusive Electro Mode, and an L1-style limiter! * Renaissance Vox - A great compressor, limiter, and gate. Increases perceived volume and stability for vocal and solo instruments. Brings vocals to the front of the mix! * Renaissance DeEsser - The next-generation DeEsser, offering Adaptive Threshold Control, yielding more natural sounding results! * Linear Phase EQ - Lets you "hear what you've been missing" by eliminating phase distortion with phase linear FIR filters to provide more transparent sound that better preserves the musical balance. * Linear Multi-Band Compressor - Provides independent gain and dynamics (compression, EQ, and limiting) on five bands with linear phase crossovers. Ideal for purist mastering on full range mixes. * L2 Ultramaximizer - This award-winning audio tool is the next step in peak limiting with Automatic Gain Control to add the extra gain you need to master your projects. IDR and ninth-order filters maintain the highest quality. One of the finest processing tools you can find for mastering, mixing, and recording, plus it's capable of extreme limiting and vintage dynamic processing effects. * X-Noise - Intelligently learns from a section of noise, and then applies a broadband noise reduction to eliminate background noise from any source. Primary controls are similar to classic dynamic processors. Eliminates learning curve. * X-Click - Effectively removes clicks from 78s or vinyl records, as well as spikes arising from digital switching or crosstalk. Operates fully automated or allows manual click removal. * SoundShifter - Shift the pitch or shift the time or both!Three tools: Parametric, Graphic, Real Time. Four algorithm modes: Sync, Smooth, Transient, and Punchy. * Morphoder - For vocoding and beyond! Eight-voice stereo synthesizer with on-screen 4-octave keyboard control. Formant correction, Q-optimized bands, and noise generator with filter for articulation control. * Doubler - Two or four voices with independent control of detune, pan, delay, EQ, and volume. Wide modulation options. * TransX - Specialized for shaping transients. Control room sound, adjust mic distance, control the pick and stick on guitars and drums, add punch or soften attacks, and highlight sustain.